The Global Volcanism Program has no activity reports for Antofagasta Volcanic Field. The Global Volcanism Program has no Weekly Reports available for Antofagasta Volcanic Field. The Global Volcanism Program has no Bulletin Reports available for Antofagasta Volcanic Field. The Antofagasta de la Sierra volcanic field is located SW of Beltran volcano, between the Salar de Antofalla on the west and the massive Cerro Galán caldera on the east. The field contains several very youthful looking basaltic-andesite scoria cones and fresh-looking lava flows, which may only be a few thousand years old (Francis, 1982; de Silva and Francis, 1991). A concentration of scoria cones and lava flows east of the NE-SW-trending Salar de Antofalla, known as the Salar de Antofalla volcanic field, also have a youthful appearance, although precise ages are not known. New Ar-Ar age dates for 22 samples taken from throughout the main part of the field ranged from 7.3 to less than 0.1 Ma (Risse et al., 2008); older age dates primarily from the Antofalla field area had been in the 0.07-6.64 Ma range. 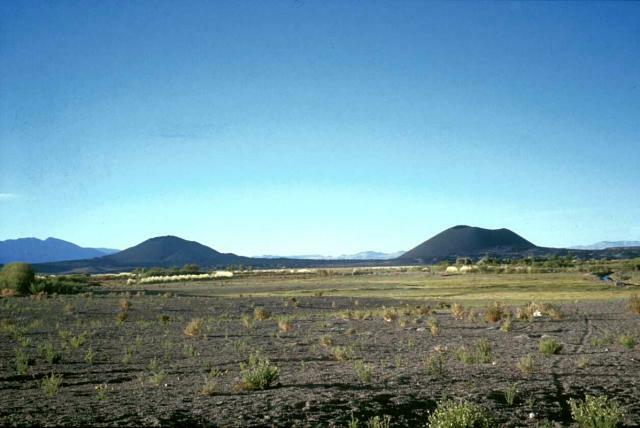 However, the area about 7 km south of the town of Antofagasta de la Sierra with the two Alumbrera cinder cones and lava flows with the most pristine appearance, and considered to be perhaps only a few thousand years old, has not been sampled and dated in any known study. An ignimbrite underlying the Alumbrera lavas was dated by Risse et al. (2008) at 7.3 Ma. Francis P W, 1982. The Cerro Galan caldera, Argentina. Earthq Inf Bull, 14: 124-133. Francis P W, Hammill M, Kretzschmar G, Thorpe R S, 1978. The Cerro Galan caldera, north-west Argentina and its tectonic setting. Nature, 274: 749-751. Francis P W, Sparks R S J, Hawkesworth C J, Thorpe R S, Pyle D M, Tait S R, Mantovani M S, McDermott F, 1989. Petrology and geochemistry of volcanic rocks of the Cerro Galan caldera, northwest Argentina. Geol Mag, 126: 515-547. The Global Volcanism Program is not aware of any Holocene eruptions from Antofagasta Volcanic Field. If this volcano has had large eruptions (VEI >= 4) prior to 10,000 years ago, information might be found on the Antofagasta Volcanic Field page in the LaMEVE (Large Magnitude Explosive Volcanic Eruptions) database, a part of the Volcano Global Risk Identification and Analysis Project (VOGRIPA). There is no Deformation History data available for Antofagasta Volcanic Field. There is no Emissions History data available for Antofagasta Volcanic Field. The Antofagasta de la Sierra volcanic field, located between the elongated NE-SW-trending Salar de Antofalla and the massive Cerro Galán caldera to the east, contains the youngest volcanic vents of the Argentinian Puna region. The area includes several "extremely youthful" scoria cones, such as the ones seen here from the SW. Some cones have been estimated to be only a few thousand years old. Photo by Ben Edwards, 1998 (Dickinson College, Pennsylvania). There are no samples for Antofagasta Volcanic Field in the Smithsonian's NMNH Department of Mineral Sciences Rock and Ore collection. Large Eruptions of Antofagasta Volcanic Field Information about large Quaternary eruptions (VEI >= 4) is cataloged in the Large Magnitude Explosive Volcanic Eruptions (LaMEVE) database of the Volcano Global Risk Identification and Analysis Project (VOGRIPA).